Registration is OPEN for our Vaulting Sessions! Email us for Info! The most mainstream description of Equestrian Vaulting would be to simply say gymnastics and dance performed on and in harmony with a moving horse! 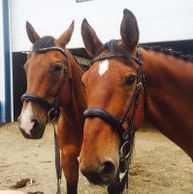 The word vaulting originally came from the French word "voltage" which means to jump over (the horse). Vaulting originated in the roman era when soldiers performed vaulting type movements in full battle armor. After the horse disappeared from the battle field these movements were refined, and are now referred to as the compulsory moves performed in competitions. 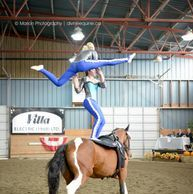 Equestrian Vaulting has become a very popular sport in Europe and is rapidly growing in North America and the rest of the world. 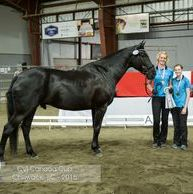 Vaulting is still fairly new to Alberta and Canada, but the sport has seen tremendous growth over the past ! 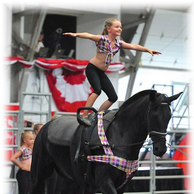 Vaulting teaches children, and adults, to move in harmony with a horse, balance, flexibility, strength and team work skills. 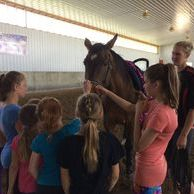 Vaulting also teaches children the basics of working with and taking care of horses, therefore making it a great activity for children that would like to get involved with horses, but have no previous experience.